“Loren Eiseley is less concerned about man conquering nature than nature, in the form of God, conquering the human heart.” Time Magazine. AFTER nearly 75 years, I have concluded that life is mostly (if not totally) a journey into mystery. E.g. how could I have possibly guessed that a simple, innocent question from a student would eventually guide me to climb Yosemite’s Half Dome over 30 times? Each visit was unique and not unlike meeting a long-lost friend with lots of catching up to do. Intriguingly, most of my trips were with students and seeing Half Dome through their eyes provided some of the most glorious moments of my life. “I Conquered Half Dome” was the title of a Biodesigner’s post-Yosemite essay, and why not? Tom described the “emotional blood,” sweat and near-blisters that were required for him to hike the 10 miles from Yosemite Stables to the top of Half Dome in one grueling day. The altitude gain was nearly 5,000 ft. and YNPS listed the trail as “extremely strenuous” (and that is without a backpack.) It is a safe bet that his 50-lb. backpack made the trek at least twice as difficult. Tom meticulously recorded the events of the day including moments of inspiration, and frustration; stops for snacks, water and lunch. He also described the logistical demands of stopping to filter water and apply “Mole Skin” to hotspots before they became debilitating blisters. He noted the high level of camaraderie and playful banter that helped ease the fatigue induced by the steep switchbacks. He marveled at how everyone worked together with the stronger hikers quietly taking sleeping bags or tents from classmates who were struggling excessively. This hike occurred in the early years of the Biodesign program when the trip was only four days. It involved a 4:00 AM departure and 5-hour drive to Yosemite Valley; one very demanding day to hike to the top of Half Dome to spend the night; one very long day to return to The Valley and the 5-hour return trip home. 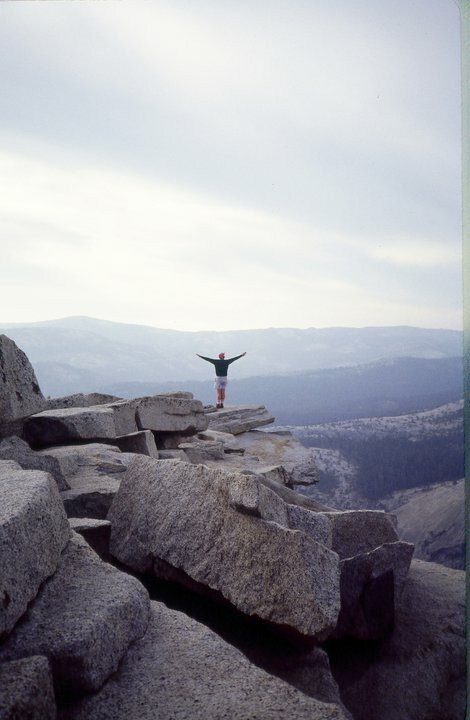 Due to the very demanding 4-day journey, it was quite reasonable for Tom to feel that he had indeed conquered Half Dome. However, the latter part of his essay took on a very different tone. 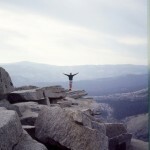 “I had never been so exhausted but I could not sleep due to the thousands of rapid-fire mental images of our long hike. Earlier in the evening, we huddled in a circle as you read John Muir’s story about his adventure with the ‘wee little dog Stickeen.’ Muir described their near-death experience in a storm on an Alaskan glacier. The ordeal lasted 18 hours and, although they were cold, wet and exhausted, they were happy to make it back to camp. “Before the trip we discussed the geology of Half Dome and I was now aware that I was trying to sleep on rock that was over 100 million years old and was there when dinosaurs roamed the earth and perhaps some bird-like forms flew over Yosemite Valley. I finally gave up trying to sleep and grabbed my flashlight and down jacket. I moseyed out to the “Eye Brow” and carefully dangled my legs over the edge. Interestingly, due to the darkness, the 5,000-foot drop was not as scary as in the daylight. I remembered you saying that Native Americans and “mountain men” could tell time using the “handle” of “The Big Dipper.” I was facing north and looked up to see the giant cosmic-hour-hand above me. And then, IT HAPPENED! A massive surge of adrenaline super-activated every nerve in my body. I was ecstatic, but it was not sublime. I was paradoxically exhilarated, but terrified and quickly began to suffer a panic attack. I could not move! I thought, ‘This is not a good place to be in the middle of the night.’ The panic seemed interminable, but either God or my “reptilian brain” took over and I noticed my hands and thighs slowly begin to inch my body back from the edge. When I stood, I was badly shaken and, with wobbly knees, returned to my sleeping bag. At the youthful age of 17, Tom discovered that he was being conquered and not the conqueror, something more and more people will live and die without discovering. I don’t think it is elitist for people who have climbed to the top of Half Dome to recalibrate their personal biography into “Pre-H-D” and “Post-H-D.” I don’t think it is possible to climb Half Dome and not have a life-changing experience, however, as John Muir noted about spiritual revelations, there are no earthly words to define them.